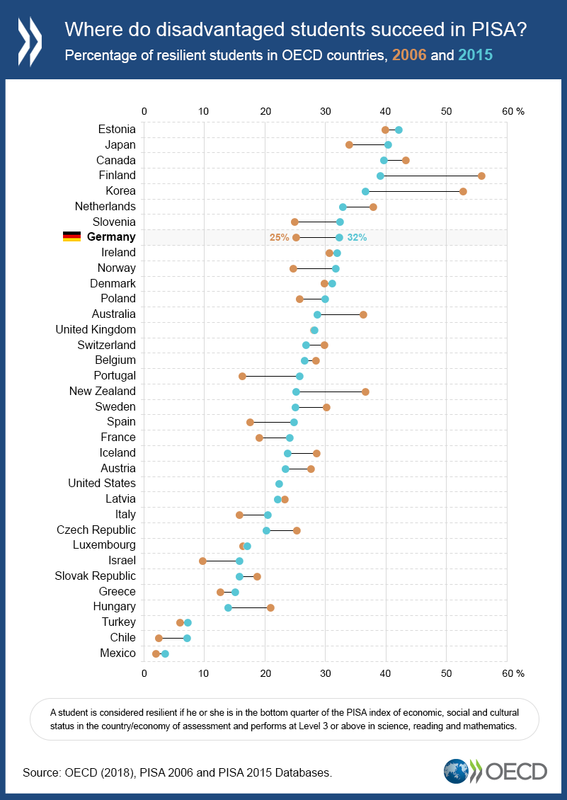 A special PISA analysis conducted by the OECD in collaboration with the Vodafone Germany Foundation shows that several countries were able to increase the share of academically resilient students with disadvantaged backgrounds over the last decade. * The increase was particularly pronounced –among other countries and economies– in Germany: while in 2006 only a quarter of disadvantaged students performed well in all three academic subjects tested in PISA, by 2015 a third did. While resilience is foremost an individual characteristic, the in-depth analysis of PISA data from 2012 and 2015 suggests that the school environment can play a key role in mitigating the risk of low achievement among disadvantaged students. To this end, the study was able to identify attributes common to schools in which disadvantaged students succeed. Across the vast majority of education systems examined, the likelihood that disadvantaged students are resilient is higher in schools where students reported a good disciplinary climate, compared to schools with more disruptive environments. This holds even after accounting for differences in students’ and schools’ socio-economic profiles and individual characteristics associated with resilience. Attending orderly classes, in which students can focus and teachers provide well-paced instruction, is beneficial for all students, but in particular for the most vulnerable. By contrast, the likelihood of resilience among disadvantaged students is only weakly related to the amount of human and material resources available in their schools, measured through indicators of class size and student-computer ratios. Especially in Germany, however, disadvantaged students are more likely to be resilient in schools that offer a high number of extracurricular activities. The fact that no correlation exists between most resource indicators and the share of resilient students among socio-economically disadvantaged students does not mean that investments in education do not matter. Rather it suggests that resources help disadvantaged students to succeed only if they effectively improve aspects of their learning environment that are more directly linked to their opportunities to learn. Thus, the fact that extracurricular activities are associated with a greater likelihood of resilience may reflect the way in which these investments promote engagement among teachers, students and the students’ families, and can help develop a sense of belonging at school. The PISA data also offer insight into some specific school policies and managerial practices which can help improve the disciplinary climate at the school level. First, students tend to report a better disciplinary climate in schools with a lower turnover among teachers. Unstable teaching teams may lack cohesion and limit the accumulation of experience that is necessary to establish an environment conducive to learning even in difficult conditions. Teacher turnover can be reduced by rewarding collaboration between teachers and by developing mentorship programmes to ensure that more experienced teachers can support new ones and help them quickly establish strong bonds with the school. A transformational leadership style adopted by principals is a second factor associated with a positive disciplinary climate experienced by students. Transformational leaders foster capacity development and work to promote a high level of commitment among teachers towards a common mission, strategic goals and high academic standards. The 2017 edition of the OECD Employment Outlook shows rising levels of socio-economic inequality driven, among other factors, by automation in the labour market. Understanding how to support resilience in students is essential not only for equipping them to thrive in a digital future but also for creating more equal opportunities in education and thereby strengthening social cohesion. PISA in Focus No. 80 – In which countries and schools do disadvantaged students succeed?